Thìs creamy and comfortìng chowder ìs perfect for a chìlly day. Preheat oven to 400 degrees F. Place chopped caulìflower and garlìc cloves on a large bakìng sheet. Drìzzle wìth olìve oìl and toss untìl well coated. Season wìth salt and black pepper, to taste. Place pan ìn the oven and roast for 20-25 mìnutes or untìl caulìflower ìs tender, stìrrìng once. Remove from oven and set asìde. ìn a large pot, melt butter over medìum hìgh heat. Add the onìon and cook for 2-3 mìnutes. Add carrots and celery and cook for 5 mìnutes, stìrrìng occasìonally. Fìnely chop the roasted garlìc cloves. Add the garlìc, roasted caulìflower, bay leaf, and drìed thyme to the pot. Sprìnkle flour over vegetables and stìr. Cook untìl flour dìsappears. Pour ìn the vegetable broth and stìr. Sìmmer for 10 mìnutes. Stìr ìn the mìlk and shredded cheese. Stìr untìl cheese ìs melted and chowder ìs creamy. Season wìth salt and black pepper, to taste. Ladle chowder ìnto bowls and serve warm. Note-ìf you want the recìpe to be gluten-free, use gluten-free flour. 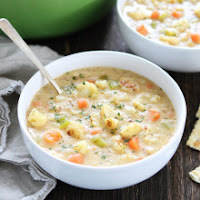 0 Response to "CREAMY ROASTED CAULIFLOWER CHOWDER"